Kurt Philip Espiritu sings ‘One Call Away’ by Charlie Puth on Pilipinas Got Talent Season 5 Grand Final Showdown on Saturday, May 21, 2016. “Honestly, you don’t have the most powerful vocal in this competition. What is expectacular is your charm,” said Vice Ganda. “Kurt, you are so refreshing. You got us when you sing,” said Robin Padilla. “The last time when you perform, you are the Philippine Justin Bieber — tonight you are Daniel Padilla,” said FMG. “I agree with vice. It’s your charm. You really perform well,” said Angel Locsin. 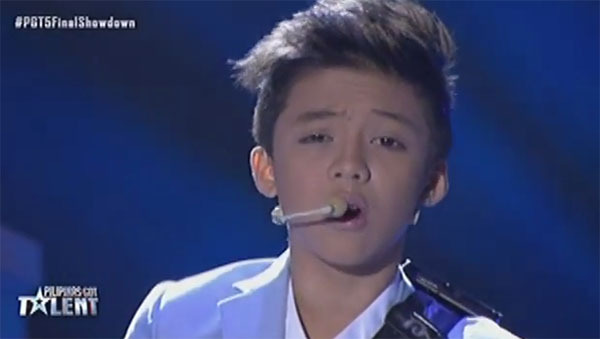 What can you say about Kurt Philip Espiritu’s grand final performance? Share your thoughts and vies on the comment section below.